In news just in, Natalie Hutchins has been appointed Victoria’s Minister for Women and the Prevention of Family Violence. She steps into the role following the passing of Fiona Richardson MP. Natalie has served in the Andrews Ministry since December 2014. She was the first woman elected Assistant Secretary of the Victorian Trades Hall Council and was a senior advisor to former Victorian Premier Steve Bracks. Natalie Hutchins has been appointed as the Minister for Women and the Prevention of Family Violence. Ms Hutchins has been a fierce advocate for gender equality and is a longstanding member of the Government’s Family Violence Cabinet Committee. She will honour the legacy of the late Fiona Richardson by helping implement every recommendation of the Royal Commission into Family Violence in full. As Minister, Ms Hutchins has led the fight for equal pay for women, delivered family violence leave for the Victorian Public Service and overseen the highest number of female councillors in local government ever. 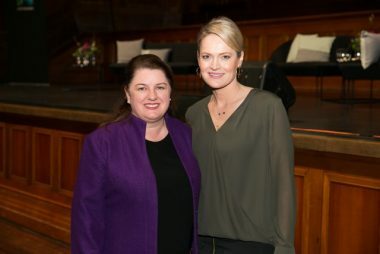 There is no one better to follow Ms Richardson, Australia’s first Minister for the Prevention of Family Violence, who helped fundamentally change Victoria for the better and save the lives of so many women and children. Ms Hutchins will continue as Minister for Industrial Relations and Aboriginal Affairs. Marlene Kairouz has been appointed as Minister for Local Government, in addition to her Ministerial responsibilities for Consumer Affairs, Gaming and Liquor Regulation. Ms Kairouz has cracked down on underquoting by real estate agents making it fairer for home buyers, while introducing legislation to help long-term renters get a better deal. She will bring this passion to her new portfolio, holding local councils to account and ensuring ratepayers get a fair go. That’s the info you can find out from a google search. Discover more about her here. Got 2 mins? Check out our recent event where we raised thousands for Our Watch.